One benefit of living in Gaziantep is the relationship the people have with the firins(Turkish bread bakeries). The locals can front up to these bakeries with thier prepared food or semi prepared food and get it cooked in these wonderful wood fired ovens. Anything from a tray of vegetables with chilies to stuffed pides to lovely desserts. I along with most of the population try to get the most out of these firins. Yesterday we had a group of friends over and decided that the local firin could do all the work for a change. I prepared a spinach, cheese and chili filling for stuffed pides and something I hadn't tried cooking at the firin before, Kadayif. Kadayif are noodles used to make a range of desserts. They are very easy to prepare and look spectacular. We have just moved to a new area and one of the firins near us do this(not all of them will) they also will make baklava for you as well. The amazing part of it all was that I only had to give them my tray, a packet of butter, some nuts and they did it all. When I got it home all I had to do was to pour over the sugar syrup and serve. I got rave reviews for my triumph of this traditional dish. As you can see the chef shows you the noodles. Cuts them into smaller pieces puts them in the tray, spreads on the nuts, then covers again with more noodles. How easy is that! I usually make the syrup first. Add all the ingredients and boil for 20 minutes until it is fairly thick. Melt the butter and pour over the noodles. Sift through the noodles to make sure they are covered with the butter. Take half of the noodles and press into your pan. Sprinkle over the walnuts. Place the rest of the noodles on top and press again. Press fairly hard as you want it to be as compressed as you can make it. Place into a hot oven and cook until golden brown on top. Then getting another tray turn over the noodles and place into the oven again. When the other side is golden brown take out of the oven and let cool a little. Pour the syrup over the cooked noodles and let it sit for a few minutes so it can get soaked up. Serve with sprinkled nuts on top and with cream on the side if so desired. So to my lovely friends, yes I did make it! and this is my secret. What little entertaining secrets I mean tips do you have readers? 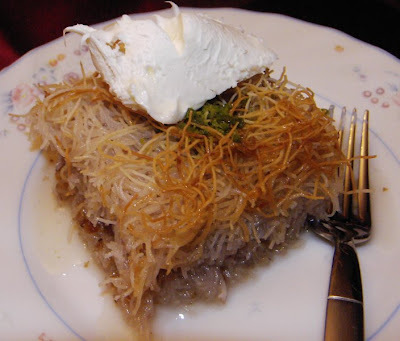 Here is the link for another famous dish Künefe using the same noodles and cheese. I have lived in a few places during the past 6 years Julia. Istanbul of course is my favorite but Gaziantep is second. Great weather, nice place and the food is the best in Turkey. When you manage to come this way let me know. Interesting recipe.When I think of noodles, I think of the ramen or stir fry recipes, but sweet noodles is really new to me.Thanks for sharing this. Hi Alisa I absolutely looove Asian noodle dishes, so sweet noodle things are a bit out of my comfort zone but I have to say all the noodle pastries in Turkey are just divine.